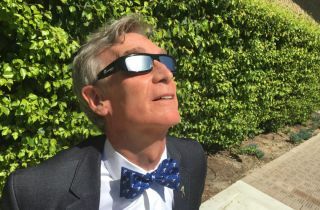 Bill Nye and The Planetary Society have joined with the U.S. National Park Service to create kid-friendly eclipse resources. The U.S. National Park Service (NPS) has partnered with science popularizer Bill Nye and The Planetary Society to create kid-friendly resources about the total solar eclipse on Aug. 21, including a special Junior Ranger program booklet and badge. The program booklet, which is intended for kids ages 5 to 13, is available for free online and at parks in the path of totality. The booklet features a cartoon Junior Ranger named CaLisa and a cartoon version of Nye, CEO of The Planetary Society and host of the Netflix series "Bill Nye Saves the World." The NPS' Junior Ranger program is intended for children and youth ages 5 to 13, although people of any age can participate. The program is offered at most national parks and allows participants to learn about the parks and do a series of related activities to earn badges. The Planetary Society and its CEO, Bill Nye, have teamed up with the U.S. National Park Service to create a series of videos about the total solar eclipse. This video shows an ancient rock carving in Chaco Culture National Historical Park that may depict a total solar eclipse. The Junior Ranger booklet encourages participants to do activities such as making up their own eclipse stories or calculating what age the child will be when the next total solar eclipse occurs in the U.S. in 2024. "The program's motto is 'Explore, Learn, and Protect,' and the Eclipse Explorer booklet and badge are designed to inspire and empower kids and families while enhancing their learning experience," according to a joint statement from The Planetary Society and the NPS.